If you asked 100 people, you might get 100 different replies, but there's no doubt that having some time and space to think - to clear your head and process your thoughts in peace - is one of the big attractions of the sport. To some, on the other hand, it can be an opportunity - just for that short spell - to escape their thoughts altogether. As the celebrated Japanese author Huraki Murakami says in his book, 'What I Talk About When I Talk About Running': "I run in a void, or maybe I should put it the other way: I run in order to acquire a void." Running can also help people recovering from tragic events in their life, and committing to training for a marathon - with all the dedication that entails, and the structure it provides - is a popular way both to commemorate a loved one and to help deal with their loss. 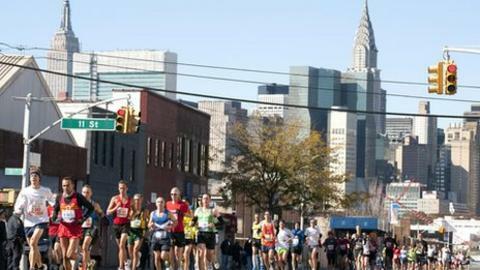 Ten years on from the 9/11 terrorist attacks, Sunday's New York marathon will be especially full of runners for whom the race is an act of remembrance. One of the 47,000 taking part will be Kiki Homer, whose brother LeRoy was the co-pilot on Flight 93, the plane that crashed in a field in Pennsylvania after passengers tried to overpower the hijackers. The Families of Flight 93 Runners who say "They Never Gave Up And Neither Will We"
The 45-year-old lawyer is the leader of the Families of Flight 93 Runners, who on Sunday will be covering the 26.2 miles through the city's five boroughs as a 20-strong group. And the New Yorker says her group will try to emulate the bond between the 40 passengers and crew on the flight that day, whose common action succeeded in averting greater loss of life, and use it as the inspiration for their own efforts. "On my brother's flight people came together and were determined to do something to take action," she told BBC Sport. "When I'm out there running on Sunday, I know there are going to be moments when I won't want to continue but I'll think about my team-mates and the 40 passengers on board." Homer first ran the race the year after the attacks in 2002. "It was very easy post-9/11 to find myself in a daze and unable to process what was going on," she added. "Just the physical act of getting up and getting out there running was life reaffirming." Around the same time that Homer was running her first marathon, former England and Leeds footballer Danny Mills had his own tragedy to deal with. He lost his son Archie to spina bifida and hydrocephalus. Since then, the 34-year-old has been a patron of Shine, a charity that supports people or families affected by either condition. And last year Mills completed the Brighton marathon in a wheelchair - a feat he described as "the most difficult thing I've ever done" - having trained for it by completing up to 80 laps of an athletics track at a time. "I think that maybe a lot of people who have been through tragedy and trauma want to share their experiences and they want to help other people," he said. "Also with exercise and running, it gives you a fantastic time to think and reflect." Mills returned to play for Leeds just 10 days after Archie died. And he says that although it was difficult to concentrate on his profession, it was also a release. "Football certainly gave me a focus and it gave me a bit of escapism," he added. "Maybe that's why people throw themselves into exercise because, as anybody who exercises to the max or competes in a marathon knows, when you're training hard there isn't a lot more you can focus on apart from the next step. "It actually frees your mind of any bad stuff or good stuff. You empty your mind completely and it gives you an hour or so without thinking about those dark times." Dr Mark Nesti of Liverpool John Moores University has worked with endurance athletes and believes the extreme nature of events like the marathon can offer moments where people may feel closer to those they have lost. "The main reason that endurance events, and marathons in particular, are special counter-cultural experiences in today's world is that you get to a point where, quite frankly, your body and mind are telling you to stop," he said. "Your mind tells you it can't find the reason to go on, even after you've thought about the charity you are running for, or the memory of a loved one who has died. "You get to a point where you are empty and not sure why you should go on. I think that is a deeply personal thing and a powerful moment. "That's the interface between psychology and the spiritual side of a human being. There is no reason to continue and at that moment you have got to the battle between yourself and yourself. "You have to make a sacrifice of everything you've got, but what you've done is joined in the suffering and the pain in a voluntary way, and that could make you feel closer to the person you have lost." Plenty of those intense personal moments may already have occurred during training, but even so Nesti says the race itself is guaranteed to spring surprises on the runner, no matter how well prepared they are. But Homer explains she and her fellow runners will have a special force behind them. "We've got this slogan on our shirts that says 'They never gave up and neither will we'," she said. "I know that thought, coupled with the amazing crowd, will propel me towards the finish line." Can anyone run a marathon at 100? Read more on Who, What, Why: How can a 100-year-old run a marathon?